Sony MDR-1ABT review | What Hi-Fi? Sony is continuing to fly the flag for high-resolution audio, and its latest push zeros in on higher-quality Bluetooth streaming. The company’s new proprietary Bluetooth codec, LDAC, claims to transmit data three times more efficiently than the standard Bluetooth encoding system – supposedly maintaining a maximum bit depth and frequency of up to 24bit/96kHz – so in theory, hi-res music shouldn’t suffer as much compression in the transmission. Both the source and headphone/speaker must be equipped with the codec. Right now, these MDR-1ABTs – wireless versions of the MDR-1As (£120) – are one of the first LDAC-compatible products, alongside Sony’s high-end NW-ZX2 Walkman and a handful of wireless speakers, AV amps and soundbars. That doesn’t make the MDR-1ABTs redundant with your smartphone or tablet, though; they’ll simply stream using standard Bluetooth, same as any other Bluetooth headphones. NFC functionality enables one-touch pairing too – the badge on the left ear cup marks the spot. Over to the right ear cup, you’ll find touch controls neatly embedded: one tap on the ear cup plays/pauses songs, as well as answers/ends calls for hands-free use. Swiping left/right skips tracks, up/down changes volume. The plastic ear cups and chrome-like details may not scream ‘upmarket’, but the soft-yet-supportive leather ear pads make up for it. Mounting them on your head is like snuggling into the sweet spot on your sofa. 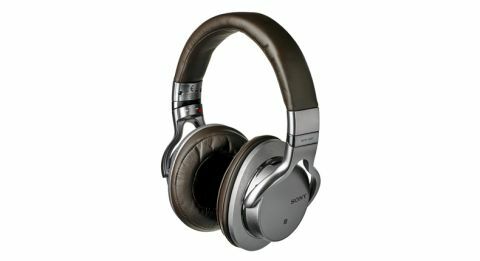 There’s generous support beneath the headband too, though the Sonys feel fairly lightweight to wear anyway. The cups swivel to fold flat into the material storage pouch, though for portability points it would be nice if they folded inwards too. Sony is no newbie in the wireless game and its experience shows. The MDR-1ABT’s sound is mature: clean, open and sweet-sounding with not the slightest hint of the snap, crackle and pop often associated with wireless playback. Smooth, refined and laid-back, the easy-like-Sunday-morning Sonys paint the orchestration in Wycliffe Gordon’s Royal Garden Blues vividly on an open, airy canvas: trumpets left, clarinets right, with trombones and drums precisely drawn in between. Said trombones dig down deep and true without ever hitting rock, proving a good character reference for the Sony’s agile low-end too. There’s plenty of detail to extract from their openness, and no sign of tonal bias. Whether you plug into – or more accurately, stream over – Supertramp or Sigur Ros, the Sony’s rendition is one you could probably nod off to in your favourite armchair. But that’s half the problem. Sure, they can throw enough weight behind electrics as we switch to David Bowie’s (You Will) Set the World on Fire, but they can feel bit withdrawn and weary. To get us tapping our feet along to the track’s pummelling drums, splashy cymbals and power chords, they need to trade a bit of smoothness for attack. We found vocals a little recessed through the MDR-1As and the same applies here. Bowie’s vocals almost feel like afterthought, reasonably insightful but not as clear or direct as through the B&W P5 Wireless or B&O BeoPlay H8s. The treble tends to cower away from the spotlight too, cymbals lacking outright clarity and crispness. The Sonys claim 30 hours playback from a four-hour charge, and we got around 20 hours with them – a fair amount of which was spent listening at fairly high, battery-hungry volumes. Wired up they gain a little more poise, remaining wonderfully open, spacious and precise, though that sense of get-up-and-go is still missing. Sonically, these Sonys do a lot of things right. But there’s also a lack of entertainment factor, which leaves us looking elsewhere.